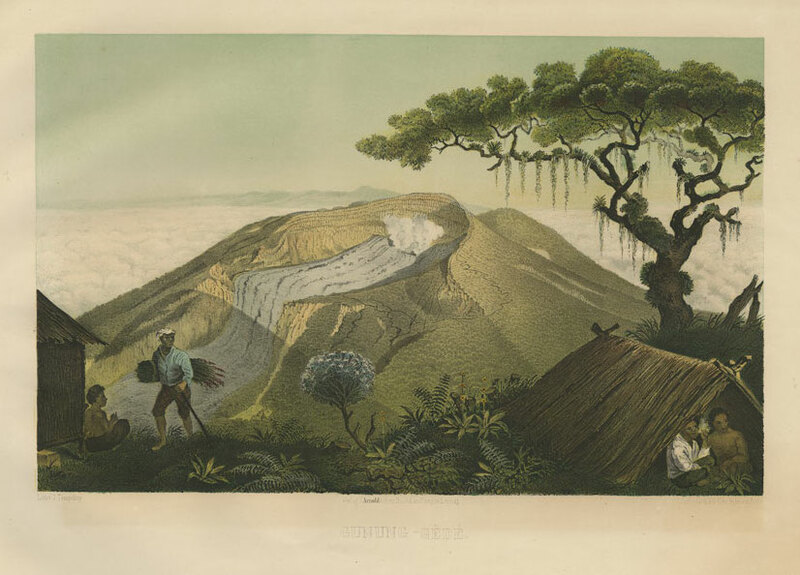 A rare and beautiful coloured lithograph of the Gunung-Gede, Java. The print is from one of two German editions of the drawing of Franz Wilhelm Junghuhn (1809-1864), a German doctor, naturalist, explorer and French Foreign Legion surgeon who spent many years in Java. In 1845 he published his Topographische und Naturwissenschaftliche Reisen durch Java (Madgdeburg, 1845), together with an Atlas of 38 uncoloured topographical plates after his own drawings. Between August 1848 and July 1855 he was on furlough in Europe during which time his great work Java, Zijne Gedaante, Zijn Plantentoot en Inwendige Bouw was published by P.N. van Kampen, of Amsterdam and C.W. Mieling of The Hague, together with an Atlas of eleven large coloured lithograph plates measuring 33 cm x 46 cm on average. In 1853 two German editions were published entitled Landschaften-Atlas Zu Java Seine Gestalt, Pflanzendecke Und Innere Bauart. Von Franz Junghuhn with smaller plates averaging 24 cm x 36 cm and printed by Gebr. Delius of Berlin and Winckelmann & Sohne of Berlin. The print of Gunung Guntur is from this edition.